Watching the evolution of the HJC helmet brand has been interesting. Starting as a purely budget motorcycle helmet manufacturer making serviceable helmets to a specific price point, HJC blossomed in 2012 when it introduced the RPHA line. Associations with MotoGP stars Jorge Lorenzo and Ben Spies boosted HJC’s rising performance profile. The RPHA line has expanded, with HJC continuing to make price-sensitive helmets. The new HJC i 70 sport-touring helmet shows that the RPHA feature set is trickling down to less expensive helmets. With the price of the HJC i 70 helmet starting at under $200, it’s easy to think that it’s a cheap lid. 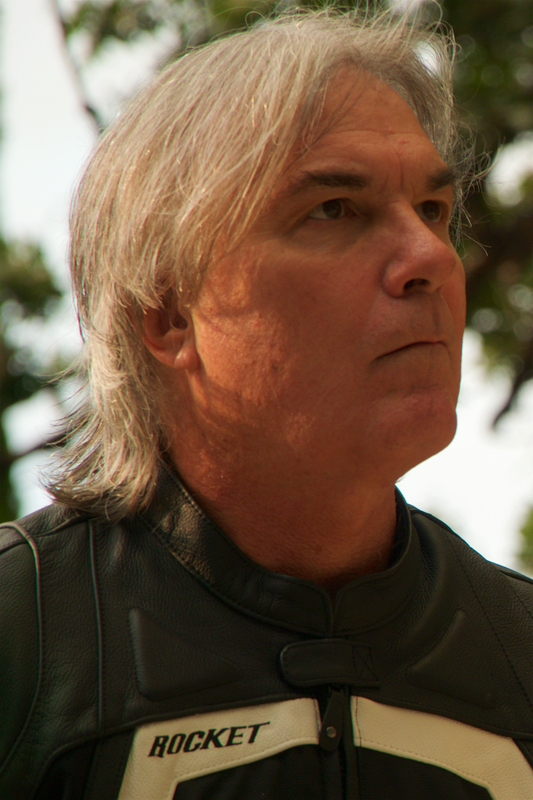 However, going sport-touring with the helmet reveals otherwise. The interior is nicely plush, offering the all-day scalp comfort you want for sport-touring. Initially, I felt that the cheek pads were a bit too aggressive on my face. However, after a single day’s ride, the liner broke-in and that feeling disappeared. The interior liner is washable, which is nice if you are out touring in the summertime. Removing the i 70’s liner is easier than replacing it, of course, and you have to contend with an array of tabs and snaps—patience helps. There are pockets in the padding for speakers, and room for glasses. Ventilation is good. There is a pair of closeable vents in the forehead, along with an always-open exhaust vent in the back. Air is sucked in, and the channels in the interior liner assist cooling. Having tested it in temperatures in the 90s, it works. Three features that the i 70 inherited from the RPHA line are favorites of mine. The first is the interlocking mechanism for the faceshield. It is easily manipulated with gloves on, yet offers secure closing. Next is the interior sun shield system. Like the RPHA helmets with sunshields, the deployment and retraction are handled by a switch on the left rim of the i 70, right about at your jawline. It is easy to find and use while riding, so it’s convenient and effective. Finally, this is an amazingly quiet helmet. 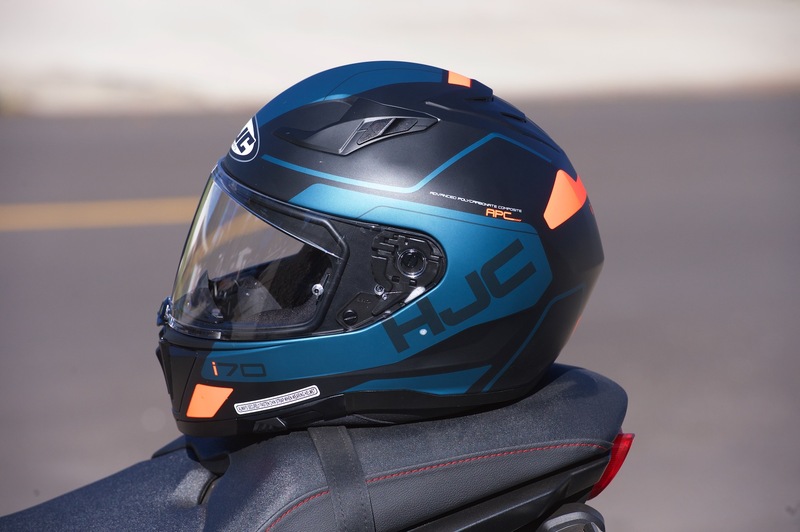 Inexpensive helmets can be noisy, but that is not the case with the HJC i 70. One of the great features of the RPHA helmets is how nicely they deaden outside sounds, and the i 70 continues in that tradition. Both the faceshield and sunshield are optically sound, so you don’t get strange reflections or distortions. My only complaint is that the faceshield clicks loudly when moving through the notchy detents between fully opened and closed. The Pinlock system is standard, which is great in humid climates. The HJC i 70’s eyeport on the polycarbonate composite shell has also been enlarged, enhancing your vision—a welcome feature in traffic. On the open road, the i 70 resists buffeting nicely, except when turning your head to change lanes; then, it catches some wind. HJC did a great job of keeping the weight down on the i 70. At 3 pounds, 5.4 ounces in a medium shell, the i 70 is less than two ounces heavier than the high-end RPHA 70 ST equivalent. Balance is excellent on the i 70, and it feels light on the head. The finish and appearance are outstanding for a $199 helmet. The matte Karon MC65F graphics do not tip anyone off that you are on a budget. Other features are as expected—there’s a mouth vent, and a double D-ring chinstrap with an easily used button retention system. I’ve worn many HJC helmets in the past, and the fit is true to size for me. Regardless, we recommend that you always get fitted for a helmet professionally, rather than buying fit-untested over the internet. The happy reality is that $200 buys you a lot more helmet than it used to. The HJC i 70 allows you to have a high-quality DOT helmet for an easily approachable price. Solids: White; Black; Semi Flat Black; Semi Flat Titanium, Semi Flat Anthracite.